No machine needed in class. Learn curved hand piecing, applique skills/fusing methods and free motion quilting techniques for Great White Throne- Zion NP. These printed fabric kits have the sewing guides printed on them. 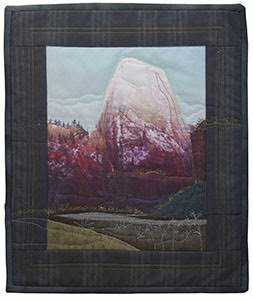 They are quick to start and make a great gift, or souvenir while you are learning the fun art of landscape quilts. Great starter project. Order specially designed printed fabric kits online by FEB 1, in the store at quiltedwesternviews.com. Enter the promo code DIXIE to receive a class member discount. With the class member discount fabric kits will cost $25 ea. Enter the promo code INCLASS to waive the shipping charge. I will bring ordered kits to class in March. Other fabric kits can be purchased at the same time but we will only be focusing on the one fabric kits during class. Kits will need to be prepaid for online by FEB 1st so that I can order the printed fabric. Order specially designed printed fabric kits online by FEB 1, in the store at quiltedwesternviews.com.